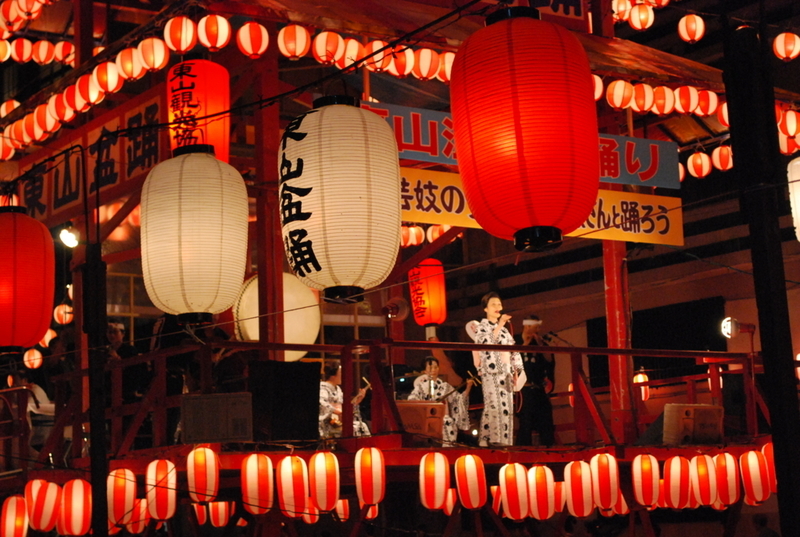 Japan celebrates Obon, the lantern festival! In Japan, August rhymes with waterlon, summer holidays, Fuji climbing, and of course, Obon! Although not an official holiday, Obon, also called the lantern festival, is one of the rare occasions when Japanese people take a few days off from work. Originating from an ancient buddhist festival, Obon is comparable to the werstern All Saints' Day: it is dedicated to the remembrance and honouring of the dead. Although the celebrations always take place in mid-August, the exact dates vary by location. In Tokyo, celebrations will last from 13th till 16th, but with the newest Mountain Day falling on the 11th, it is expected that most offices will be closed from August 11th till 16th. On the first day of Obon, families set out lanterns or small fires at the entrance of their houses, to guide the spirits of their departed loved ones home. During the few days that follow, food offerings are placed on the buddhist altar of the departed at home, and their graves are visited and cleaned by family members. Obon is also the occasion to perform ritual dances: while a group of musicians sing and play music with traditional Japanese instruments, dancers performs different choreographies around the city streets in their traditional costumes. And come the last day of the celebrations, families see the spirits of their loved ones off: where there is water nearby, the lanterns are set alight once again, then sent out to float in a beautiful and final spectacle. Obon is a great occasion to enjoy Japanese culture and traditions, and to spend quality time with your family and loved ones. And if you lack inspiration as to how to celebrate it this year, why not try one of our escape rooms? Escape Hunt Tokyo has three Japanese-themed game rooms waiting for you, and guarantee you 90 minutes of great fun with the people you love! Will you try our ZEN, Samurai Espionage, or Runaway Bride room? Book now for a memorable adventure!